Here is another amazingly easy fudge recipe I'm excited to share. 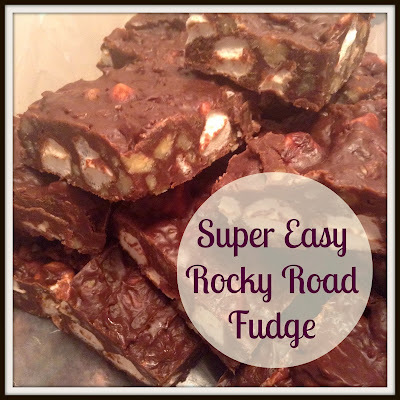 Every year I make this Rocky Road Fudge for friends and family and everyone absolutely loves it! When placed in a fancy treat bag or cute tin it makes it even more extra special. Your friends and family will think you've spent hours in front of a hot stove when you've only spent under 5 minutes. Really? So give it a try. If you love this recipe, be sure to try our Super Easy Peanut Butter Chocolate Fudge recipe here. 1. Combine milk and chocolate chips in a large microwave bowl and stir. 2. Cook for 1 minute in microwave. 3. Add vanilla and cook for 3 minutes. 4. Now add marshmallows and walnuts and stir. 5. Press into a greased, foiled lined 13x9 inch baking pan. Chill until ready.